The Immigration Department, which falls under the portfolio of Premier Dr The Honourable D. Orlando Smith (AL), is presently going through a transformation and polices and practices continue to be added or altered. 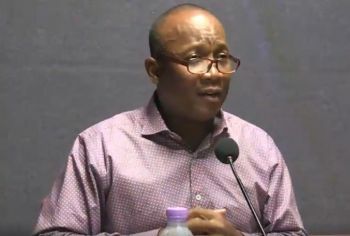 Agriculture, on the other hand, is spearheaded by the Deputy Premier and Minister for Natural Resources and Labour Dr The Hon Kedrick D. Pickering (R7), who has been criticised many times before for not making full use of the territory’s agricultural potential. Both departments were addressed by Minister Walwyn in his speech at the H. Lavity Stoutt commemoration at West End Cemetery at Capoon's Bay, Tortola on March 5, 2018. 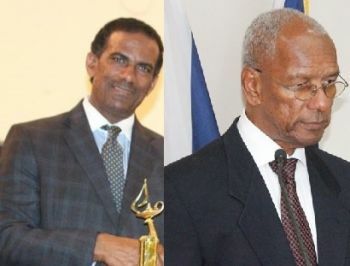 Honourable Walwyn is known for chastising other Members when he thinks they are out of place, as was the case when he hit back at Hon Melvin M, Turnbull (R2) for speaking up against Premier Smith while in the House of Assembly in December 2017. “How could this be possible? How could you be carrying my portfolio and I allow you to speak on a sustained basis out of turn? That portfolio needs to be pulled. Mitch, Marlon [A. Penn], someone else needs to be placed in that position,” exclaimed Mr Skelton-Cline. He continued to explain that the Agriculture of the Territory is not where it used to be and suggested that the food crisis that was faced in the aftermath of the hurricanes of 2017 would’ve been less if we were growing more of our own food. Minister Walwyn further added: “HL would’ve actively pursued various ways to get persons to once again recognise the importance of Agriculture and starting their own gardens, and this is something that I dare say that we must all now endeavour to do." After the snap election of 2015 when Premier Smith told the public the cost of a wall erected around the Elmore Stoutt High School (ESHS), Hon Walwyn went on radio to contradict his leader, claiming Dr Smith had provided wrong information to the public and that his Ministry showed a smaller figure. He also said the work done included a project on Virgin Gorda. Months later, the controversial Minister admitted that the Minister of Finance's figures were correct. The project is currently under investigation, as ordered by former Governor John S. Duncan OBE. It was also in November 2017 that Hon Walwyn told a local publication that he was willing to take a 50% pay cut as the Territory recovers from the devastation of Hurricane Irma and had challenged all legislators to do the same. His challenge came under scrutiny by Mr Skelton-Cline on his Honestly Speaking show on November 7, 2017. “I find that interesting for two reasons, one, he is not the Minister of Finance and he is not the Premier and it seems to me that it is a discussion that could have been or should have been had among colleagues and they come out together, in terms of directing and showing leadership,” Hon Skelton-Cline stated. How you going move the only Minister of government that is working for the ppl. He has stepped up to the plate and could be the next Premier, if the NDP wants to retain power. name two things he has done beside the wall? think about the song your child sing and the 95 % we just got top in the Caribbean so reply what do you have ? Did he study for the kids? Those kids got high marks because of their teachers and their dedication to their studies. At the end of the day CXC is only good if one wants to go to school at UWI, no other institution gives a rats behind about it. My son wanted to go to a college in Canada. First thing the college asked for was his CXC results. And they looking at Cape not just CSEC. Lol someone mentioned the song as an achievement. That song is useless in the real world. Great cone back punch, lol, lol! Be wary about the use of percentages (%) when you see them used in this way. They could be very very misleading. Instead, look behind the percentages and examine the absulote number of students taking the exams against the number (absolute) of passes for each terrirory and tell me if the 95% is not misleading. The KEY here is " Minister of Education and "CULTURE".It is the general believe, that the Minister in charge of this prestigious ministry (ESPECIALLY CULTURE) should be an indigenous B.V Islander. Walwyn and others who were born here with at least a parent from somewhere else...in this case Antigua, does not fall into this category. if there is any truth that Minister Walwyn is aiming to be Deputy or the Premier, this is his biggest obstacle. Remove him as an elected official period! He does not have this country's best interest at heart nor does he have the maturity to govern period. The No Direction Party had no call allowing persons such as the said minister to run for office in the first place. Tak what you get and deal with it. Just next door in Anguilla, the constitution says, " In order to serve in the House you must be an Anguillian born in Anguilla. where do you think the said minister was born. Sometimes is best to just shut the hell up and get the facts before embarrassing yourself in this manner... smh ayo always looking news and spreading wrong news. Look like you was in the delivery room when he was born man. Atleast he had the guts to try to make a difference. meanwhile many of you are sitting behind a computer bashing him but then still running to him for help! You need to go read the 2 constitutions before you rant about who was where and who from where. That is good isn't it ? Remember what is an Island. If you do you , will soon realized that the BVI is not a continent therefore, every person born here is deemed to be an island man/ woman. Hurricane Irma tried to teach us a lesson but it is obvious we have not grasped it. and not a man could name 1 thing he has done? "Up to standard" is a very serious comment to make. I wonder if some of you parents wearing rose colored glasses or you just totally oblivious. Education is in a state! And its not because of Irma. Classes are overcrowded, classrooms are not conducive to learning, teachers are not given resources, the "bringing technology to the classroom" flopped because there is no good consistent internet service in the school, and in some instances the rooms have electrical problems. Some children have learning disabilities that require a completely different program than the other children but yet they are placed in a regular setting were they will continue to fail, and then we can blame the teacher who we know does not have any special education training. These are just a few of the many many problems. Heck there were days when schools could not get cleaning supplies or toilet paper! I dont think the minister of education is aware of many fires he has burning in education because the people who work close to him are afraid to challenge him when he talks. He likes to think of himself as approachable but he really is not. As long as he is minister education will not stabaluze in this territory. He belongs in a courtroom not a classroom! We tried to have these comments published on other news sites toward articles praising the minister of education by external entities, but for some reason, they have not been posted. Hopefully, VINO will post these necessary comments to add to the dialog and discourse on Education in our country. These comments are neither for, nor against, the minister of education, but rather toward suggesting to all with positions of influence to tread lightly with any political tactics in our education system when it comes to the harvesting of the minds of our young ones for the future. Listen…and Listen Good. Yes. Some Educators who work tirelessly toward trying to improve our Educational system should be acknowledged and supported generously for their research and work they have putted in. However, when we have these external entities praising any politician, it becomes highly "suspected." Of course, Mr. Jules and the others of late, who have been blowing their trumpets lauding the initiative, have a reason to do so. “Optimizing BVI engagement” for this initiative is in essence- optimizing Caribbean Examination Council causes and revenue agenda, of which they are apart. So quite naturally- “gasing-up” the "piper" is highly encouraged to keep their ultimate agenda flowing. If it was being done for free, the praises would be few and far apart, if any. Capitalism always has a funny way of encouraging direct praises to those who have direct influence or control of the purse strings, especially when it is being easily subsidized by hard-earned taxpayers’ dollars. Yes. It is a possible start that only the future can predict, but Pleaseeee!!! All of you'll politicians in education and otherwise throughout the Caribbean- Pleaseeee- Stop playing politics with our children’s education for you’ll personal agendas. If we are teaching our children to fully “adopt” (different from adapt) to these standardized tests, let us hope they are not being conditioned and robotized in the process just towards test taking; and as a consequence, if so, there again, they turned out to be still not capable of thinking deeply, critically and holistically for themselves as individuals, with independent minds. If we are truly serious about developing a healthy country- moving forward, we do not need any more clone-like mentalities, nor puppets, who have been conditioned to just accept the status-quo without challenging its authenticity. We are advocates for a more Multiple Intelligence Foundation. So, we repeat- Stop playing politics with our children’s education. And this goes for all the manipulators in high and low positions of influence throughout the Entire Caribbean Diaspora. Serious Times Call For Serious Awakening of Our People. Is another coup d' tat ? Claude is an empty kerosene can, nobody cares to hear his drivel. He is just upset because he got kicked to the curb and can no longer walk around with his chest high like he getting an asthma attack. He is telling the Premier to strip his most popular Minister of his portfolio!! LMAO!!!!! Myron got over 5,000 votes each time he ran and will get even more next time around. He is an elected official putting forward ideas and solutions for the Territory and because it's not in his portfolio he shouldn't? So he should cancel his YES program which is working well, because it helps young people find jobs and it falls under Labour? What you need to ask yourself is why we are not hearing from Kedrick on Labour or Agricultural issues at all. The man like he doesn't care about the regular people he represents. Myron don't mind the noise, they are threatened by you and your works so keep your shine head on. is h even should be in our House? That's what happens when you leave your house open. Myron should be sitting pretty if the only thing they can keep bringing up is a wall that cost $1.8. At least we got the wall! Let's talk about the after school program that was part of the 'good to great' regime where a Pastor returning from the USA was given over $800K and we got nothing in return. Claude better choose his battles carefully. Claude are you out your f$&ing American mind. Move and put them dunce? You need to shut up. All ndp must go! Sickening man. Dont bother with them Mr. Walwyn. Keep doing you. You are the only minister who produces results. Let them take that. Some fast asleep and others sleep walking. I admire you and your work ethics. You make things happen instead of waiting for things to happen. I don't even want to touch agriculture and fishery. Lawd help we!!!! I think we need to vote on who should be premier between Dr Pickering and Myron .This need to done asap . Myron. Myron...Myron.. Myron every day and any day.. Look at Agriculture and Labour.. Hmmm. This man dont care.. Lqbour workers only showing up and collect their pay.. What do they do? Dont talk about Agriculture... Myron over Picko any day. Myron is not my pick for premier.. Me personally prefer Ronnie as Premier amd Either Myron or Malon as deputy..
Claude you are wrong with this one. Tell me which other minister doing more and getting results than Myron..Agriculture, Labour. Communication all failing and dragging behind. Stop the hating and be fair. What is needed is a complete shuffle.. Myron will even be better in health.. Kedrick Education... Ronnie Finance labour....Mark Agriculture and Tourism......Premier Works and communication.. That's the shuffle we need.. The Labour Minister is the traveling Minister who don’t give a dam about Labour or Agriculture. Why you are not hearing from him is because he spends more time at his Private Pratice than doing what he was elected to do. To be honest the Education Minister and occasionally the Works Minister you see and hear. It’s time that election be called, these guys are tired and stressed. I couldn't get pass " work and research they have putted in..... "
Hon. Walwyn is the only one doing his job and doing a good job at it ....remove wat?.....If you all don't want an earthquake come here you better let him be ....he is the only one trying to help the people ...since Irma passed how many of the government ministers expended a hand to help the needy?...who can answer me? @ boom: less some of us also forget; the same fellow point fingers every week, is the same chap under whose stewardship millions & millions of our tax payers money can not be accounted for(oh what a tangle web we weave) life is really funny especially here in the territory(can you say pier park project....” I know U could”)!!! I just vex he change Festival village to open on a Monday instead of Friday. I think Friday was unique for us and I want it back. Not because Antigua does open their on a Monday, we have to do the same. I read this thing like 5 times trying to figure out what Myron said wrong and cant find it. That is the sad mentality of this place.. I am not a great fan of the NDP, simply because they failed us during the most critical time in the history of this territory but if we as a people are honest with ourselves and put aside our own selfish agendas we will admit that the Hon. Myron Walwyn was the only minister who rose to the occassion to get his area back up and running in short order despite the challenges. Is he perfect? No but he works his a** off to improve education and we should be supporting him 100% not trying to pull him down. I will vote for him to be the next Premier because he has potential and that counts in my book. Boy move your "Need a pacemaker to live" out of here .... Myron is the BEST THING SINCE SLICE BREAD in the Govt !!! I wish he could've done ALL yall jobs and call it a day !!! But right about now, y'all ain't no help because he can't do it by himself ... so I Call for the UK to appoint a Govt Body to Govern the BVI properly !!! !